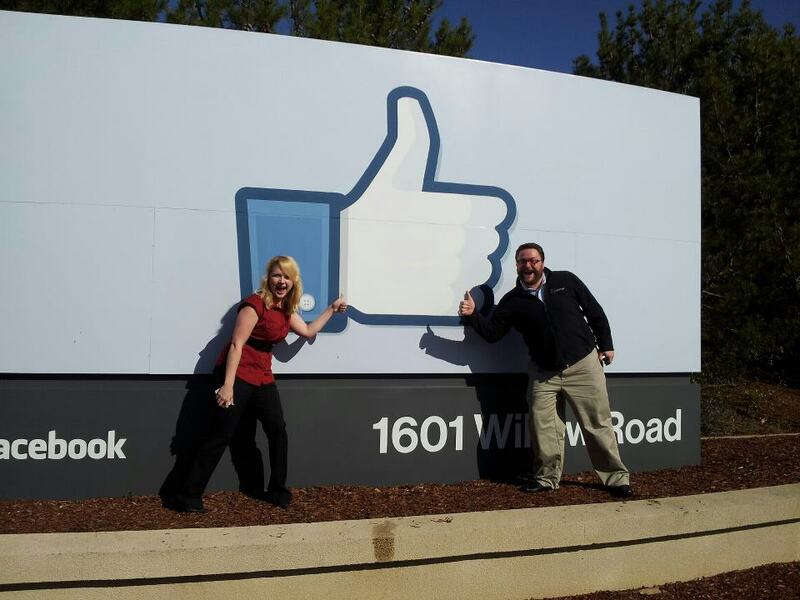 Me and Zak, really "liking" Facebook's sign. Yesterday, I had the privilege of visiting Facebook’s new headquarters in Menlo Park, Calif., with two Altimeter Group colleagues – Rebecca Lieb, advertising and media industry analyst, and Zak Kirchner, a fellow researcher. I found the briefing time with Facebook team members extremely valuable, most for the glimpse we were given into Facebook’s advertising future – a future that is rooted in contextual relationships and, I believe, eventually will place more weight on peer-network influence. One of the Facebook employees we chatted with was Brandon McCormick, manager of global communications – monetization. One of the most interesting items of discussion was Facebook’s growing emphasis of providing highly valuable advertising content to its users, done so by ensuring that content is not only relevant, but also contextual. Content relevancy has been maintained by Facebook for awhile in its advertising. The ads you see when you log in are usually tailored to your interests, as that’s what advertisers are paying for. They can choose specific keywords, demographics and interests when deciding who to target within Facebook. What’s new here though is that real-time ad experimentation is also happening. So, if you post “I love pizza,” your ads will soon refresh to include those that relate to pizza or other food options. However, adding context is a new layer that Facebook has only most recently begun to dive into. You may have seen a new type of ad pop up lately in Facebook – one that showcases the connection between a brand, product or service and your friends. Facebook now offers advertisers the opportunity to boost context of their ads by further amplifying their connection to your personal social network. The question remains though … does it work? That wasn’t clear yesterday in our chat with Brandon, but I’m assuming that it has to increase click-through rate, based on the sheer purpose of social networks like Facebook – to connect you to the people and things that are important to you. If a brand, product or service is meaningful to your Facebook friend, it makes sense that it would have more pull with you than another brand page that has no connection to your network. But, Brandon didn’t share any specific data, so I can’t say for sure. This conversation led to another between me and Zak – how does network and user influence play into the Facebook contextual advertising game, if at all? Brandon’s response was that, no, Facebook doesn’t weight one user’s influence over another’s when considering whose endorsement to feature next to a brand’s page or social action. However, I’m not so sure that will be true in the future. It only makes sense that Facebook would take advantage of individuals who have a higher influence within their network when it comes to helping advertisers drive click-through rates. If I consistently interact with a handful of friends on Facebook – more so than any other friends – that would serve to mean that I exert an increased amount of influence over them, and vis versa. (Yes, a social influence graph is more complicated than that, but that’s the gist for purposes of this post.) Wouldn’t Facebook want to use that influence data to even further heighten the context of its advertising to me? I’m curious to see how Facebook continues to evolve its content advertising within the network. Real-time relevancy + influential social context will undoubtedly create ad experiences that are not only positive but, dare I say, welcomed. What do you think? How have Facebook’s latest advertising evolutions impacted you, and do you believe further emphasis on network influencers would spark an increase in ad attention and action? Great post Jaimy! You have to think the contextual/friend relevance stuff will take hold. Especially since Facebook, historically, has LOWER CTR than regular ol’ banner ads. It’s almost like they’re using old media tactics in a new media model. Interested to see how it shakes up! Agreed, Jon! Thanks for the comment. I’m really curious to see how their advertising offerings and models evolve as they take a deeper dive into user data/social graphs. Just think … future ads may not even be content created by a brand – they could be content created solely by someone who influences you. Sort of like “Sponsored Stories,” except the content is completely generated by those within your personal network. Lots of possibilities.